So there are some interesting concepts here for the final set of Second Round matches for the Asian segment of the World Cup Qualifiers 2018. In addition to the Group Winners, the 4 best runner-ups will go through. The best placed runners-up table is tight, as is to be expected. 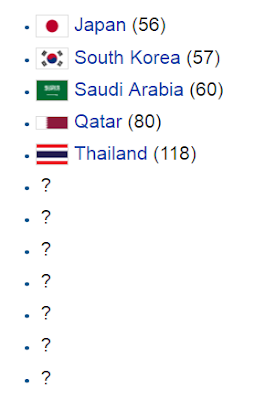 Some teams were disqualified from competing in the World Cup Qualifiers (Indonesia and now possibly Kuwait from memory). This has had ramifications on the above table. Some groups have 5 teams, and some have 4 teams. So an adjustment must be made. In groups with 5 teams, points won against the bottom-placed team are removed for the purposes of this table. You would expect that, in most cases, this would be a matter of removing 6 points (2 likely wins against the worst-placed team). The runner-up in a group with 4 teams does not need to deduct any points for the purposes of this table. 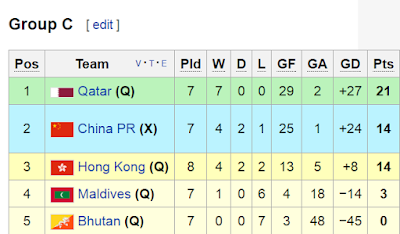 Of particular interest is Vietnam, which sits at 3rd in Group F, only 2 points behind Iraq. In Group F there are, in effect, only 4 teams as Indonesia was disqualified from participating. So for Group F the points scored by the runner-up team stand as is and no deduction is required. Vietnam's final game is against Iraq. 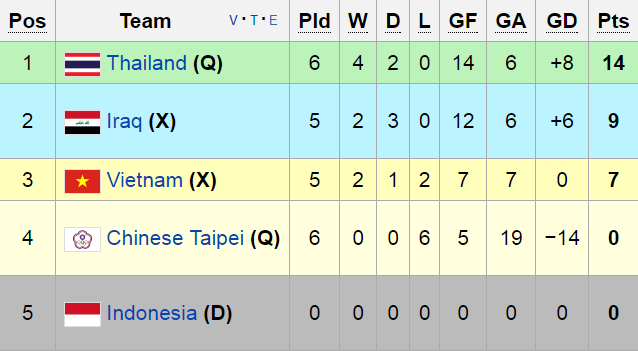 If Vietnam can muster a shock 3-0 or 4-0 win over Iraq, that could potentially send them into the Top 4 Runner-ups -- a difficult task in truth because it relies on North Korea losing to the Philippines (which does not seem likely) as well as other match outcomes not in their control (see China). It's very unlikely Vietnam can make it through. China have more of a chance (but still not a very good chance). Essentially, for China to progress, almost all of the Runner-ups with 10 points must not gain 1 or more points; and the others with less than ten points must, preferably, not get more than 1 point. For all that to happen at the same time is pretty much impossible, but I suppose you never know. Points 1 and 2 mentioned above (UAE and Jordan losing) are plausible but by no means guaranteed. Assuming they do happen, and assuming Iraq and North Korea do their jobs, then there will only be 1 spot left for China. 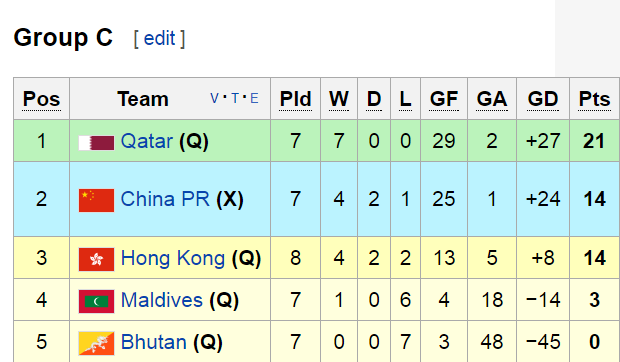 Provided that Oman does not score too many goals, and China can provide a shock win, then that spot is potentially there for China's taking. But it's quite unlikely China will go through as there are a lot of assumptions going on here. In reality I expect North Korea to go through. Syria should, in theory, also go through even if Japan thrash them in their final group match. Being 2 points clear at the top of the runner-up table is quite a great buffer. 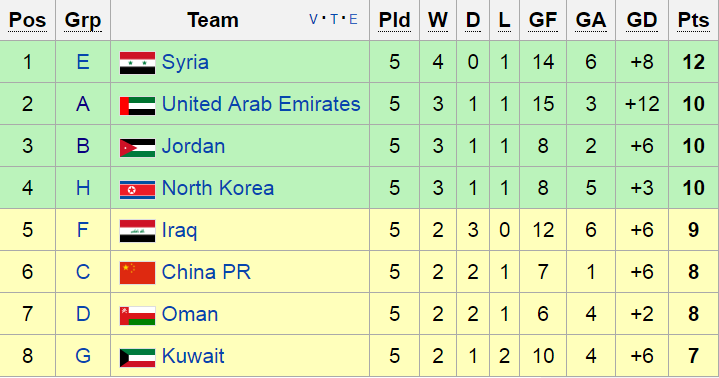 For Syria to not qualify after losing to Japan would require 3 wins from the other teams on 10 points, and Iraq to have a goal difference of at least +2 against Vietnam. Those are relatively long odds. The UAE v Saudi Arabia scenario is a bit of an interesting problem for the UAE, as it depends on the team the Saudis will field. Saudi Arabia have already qualified. 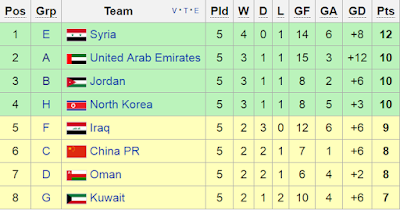 If the UAE and Jordan lose or draw, I expect Iraq to storm into the Top 4 unless Vietnam shocks. Even if only one of UAE or Jordan is successful in their respective match, Iraq should still be fine. I don't expect both UAE and Jordan to be successful. The odds of UAE and Jordan both overcoming their scenarios is relatively long. This leaves Jordan in a precarious position as they will stay stagnant on 10 points if Australia win - potentially knocking them out if other teams win their matches. I think the UAE is quite resilient though, and may take out the final spot, perhaps with a grinding draw. I am looking forward to upsets of any kind, barring any that would cause Australia strife.